Inside London's First, And Mos.. The 2015 Australia AeroPress C.. In the last couple of months, Istanbul has been bursting with new cafes, roasters, competitions, festivals, and museums about coffee. 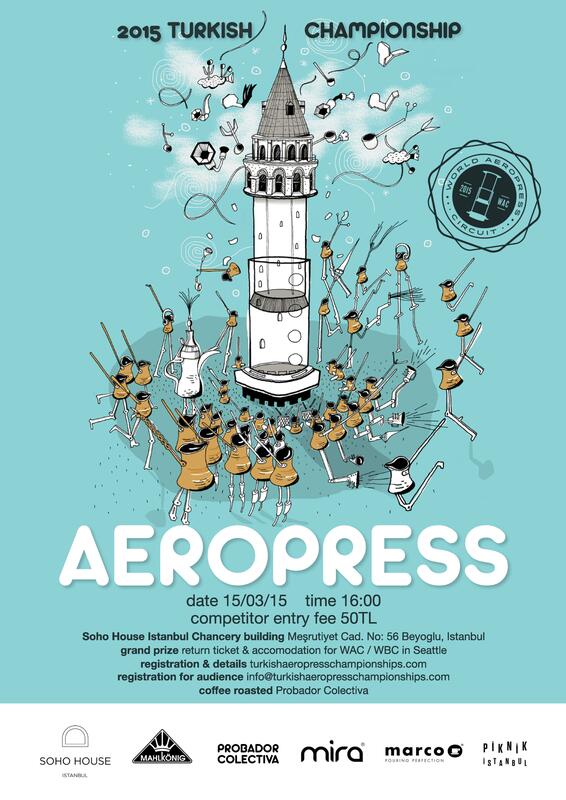 And on Sunday, March 15th, the first annual Turkish AeroPress Competition took place at the recently opened Soho House, Istanbul, which once housed the US consulate. The competition was organized by Probador Colectiva, with event sponsors Mahlkönig, Marco, Soho House, Norm Coffee, Piknik Istanbul, and AeroPress Turkey representative Mira Gıda. Probador Collectiva is a new project by Çağatay Gülabioğlu, who is the founder of Kronotrop, an excellent Istanbul coffee bar profiled previously on Sprudge. Probador Collectiva aims to be a education and workshop center with several coffee roasters where anyone can get a roasting education. Roasters will be available for rent so that cafes who don’t have the space or budget will able to roast their own coffee. There will also be cupping sessions, brewing technique courses, and Gülabioğlu will also be coaching national competitors. The three judges of the competition were Daniel Thompson, head of the coffee department at Soho House; Aslı Yaman, head roaster at Soyuz Coffee in Russia; and Çağatay Gülabioğlu. Probador Collectiva provided 18 competitors with coffee from Ninety Plus. Prizes for the three winners were an AeroPress, Able filters, and a Baratza grinder. The crowd was excited, doubly so for the fact that this was a first-time experience for both contestants and organizers. And with stiff competition, Ufuk Arslan took home the first place prize. However, because of a delay in the visa process, the second place finisher Refika Kortun will be representing Turkey at the World AeroPress Championship in Seattle. Gökçe Yildirim is a Sprudge contributor based in Istanbul. Read more Gökçe Yildirim on Sprudge.